In 2017 the ISM published a feature article from Garry Mansfield, founder of Outside In in their Winning Edge magazine. 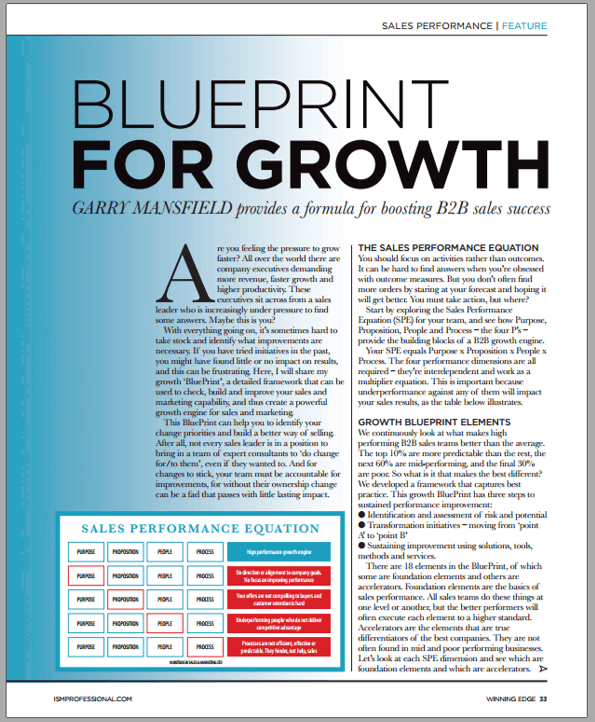 The article focuses on the key elements of growth for b2b sales, and offers a BluePrint that can be applied to your business and help you to assess, transform and sustain a better way of selling. We have attached a PDF for you to read, enjoy it and I hope it helps. If you would like to discuss how we can help your sales transformation efforts please get in touch. Subscribe to ideas and tips that help you grow. You're in. Look out for ideas and tips from us. Your data is safe with us. We wont bombard you with emails and you can unsubscribe at any time.